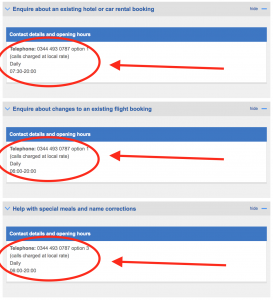 Calls to British Airways on 03 numbers are charged at a local rate, but are often inclusive in most call packages. Check your provider for details. To contact a member of the British Airways Customer Service Team, then quickly get in touch by calling 0845 682 0192. Call this British Airways contact number to resolve queries, make new bookings, discuss amendments and add extras to your existing booking. British Airways customer service contact number is 0344 493 0787. This will put you through to a British Airways customer service member who will be able to assist you with your query. British Airways is one of the worlds largest airlines, and has millions of customers that travel with them every year, therefore its customer service team has to be ready on hand to help. Because of its size, British Airways have more than one customer service department, so in order to help you contact the right department British Airways have provided several contact numbers which we will highlight below. A simple google search brings up British Airways main contact number which is 0344 493 0787. However when we take a deeper look into their main website, (which can be found here) you are greeted with the following webpage with several customer service departments. 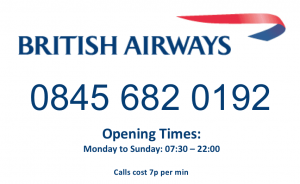 If you are going to contact BA, through one of our British Airways customer service contact numbers then British Airways ask is that you have your booking reference ready when you call. This will help speed up the call so the customer service representative can help you with your query straight away. If we expand the first segment which is labelled “Make a new booking or check prices for flights, hotels, cars or upgrades”, it shows more information including their customer service contact number which is 0844 493 0787. You may notice that this customer service number is actually a pay for number, which means it will charge you 7p per minute. 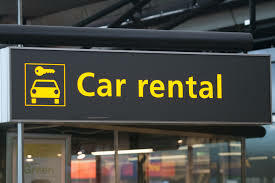 However if you are looking for a local rate British Airways number, you should contact 0344 493 0787. These local rate numbers are normally included in your phone contract packages, but you should check with your provider first. 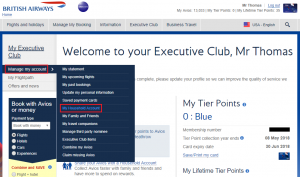 You can continue expanding these segments, you will uncover the remaining British Airways customer service contact numbers, but to save you time trying to find the right department, we have made a summary table at the top of this page, which will help you easily navigate through all of the customer service departments. British Airways don’t have a 24 hour helpline, they do have a number available for emergencies and this is 0845 682 0209. Calls cost 7p/min. If you are calling from abroad, you should dial +44845 682 0209. International charges may apply. Although British Airways don’t have a 24 hour line, they do provide help in emergencies, so don’t hesitate to contact this number if you need assistance. 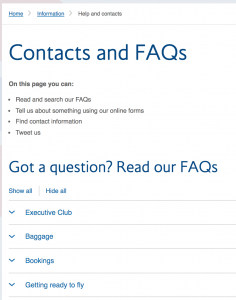 A helpful guide on how to reach British Airways helpline number can be found in their FAQ’s section of the contact us page here. We have also put together an in-depth article on the best British Airways emergency helpline numbers here. So if you are in an emergency, you should visit this page. For example if your flight is delayed of cancelled, they outline the most important action to take to get your issue resolved quickly. 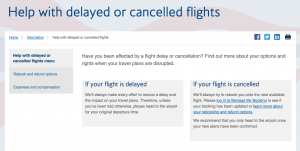 Take a full look at the British Airways emergency contact page here. 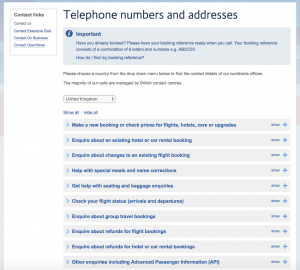 But below is a screen grab of the information so you can continue reading about British Airways helpline numbers. 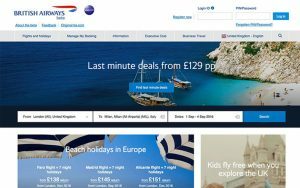 If you can think of any way in which British Airways can improve their helpline services, then get in touch with them directly on ba.com. We have been in touch with British Airways to ask why they haven’t included a 24 hour helpline number available online, if this becomes available we will keep this page updated. You can find some useful information on what to do if you find yourself in an emergency abroad here. British Airways telephone number is 0344 493 0787. You can use this number to telephone British Airways about customer services related issues and general queries. When Does British Airlines Open? There is also plenty of information and advice on how to book your holiday online here. You can also manage your booking online if you visit your account section like in the below image. Call an individual from the British Airways Sales Team will do everything in their power to help you. British Airways have been flying for over 90 years. British Airways commended its 90th commemoration on 25 August 2009. To stamp the event, the British Airways Heritage site was opened on ba.com. You can take a look at their most recent promotion “Fuelled by love” which really tugs on the heart strings and affirms BA’s dominance in the market. The first thing you want to do is pick up the phone and call British Airways customer service number and book a holiday immediately. Contacting British Airways has never been as easy, use the phone numbers provided above to get in touch. You can find more information on why you should contact British Airways here. To examine your Executive Club account, as opposed to call Customer Relations please contact Executive Club. To change a booking or activity a discount please call us on the number underneath where a partner will be glad to help. In the event that you don’t have telephone you can email British Airways too. Make sure you contact British Airways to get the most of their customer service. British Airways participated in the outline of the flying machine with Boeing, and is today one of the world’s biggest plane companies. The Boeing 777 has developed as a success for longhaul business air ship on account of its superb fuel productivity and lodge comfort. Contrasted with the 777-200, the Boeing 777-300 highlights a more drawn out body, raked and expanded wingtips, another principle arrival equip, fortified nose apparatus, and additional fuel tanks. There are plenty more contact numbers for British Airways, but 0845 682 0192 will certainly get you through to the right department. Facebook is a great place to get in touch with British Airways. You can find their Facebook page here: https://www.facebook.com/britishairways/. Twitter is another great place to contact British Airways. You can find their tweets below, and if you use the handle @British_Airways then you will be able to contact them through Twitter. Contacting British Airways through Youtube. As long as you are signed in to Youtube you will be able to post comments, and talk to British Airways customer service. The way to see British Airways Pintrest page is through here: https://www.pinterest.co.uk/britishairways/ they post excellent content, but most importantly, it allows you to contact British Airways. Another great way to contact British Airways is through Google Pus, link below. Be sure to check out these pages, and bookmark this website to keep up to date with British Airways contact information.